The Vålådalen excursion undertaken by the Nordic Lightpackers was, as has been described, soggy. Temperatures where not in the region that would make anyone eager for loitering in their swimming trunks. That kind of weather emphasizes the need for fuel. Food, grub, chow is really the fulcrum around which our lives turn. That is more than obvious when you are hiking and using up quite a bit of calories. Here is a look at my kitchen for that particular trip. It is pretty austere and some of my fellow hikers were more innovative not to mention culinary. But they have to speak for themselves. Starting with the stove, my choice can be seen above. For some years I have been hooked on the convenience of gas canister stoves and have used the Primus Micron during that period. Weighing 95 grams it used to be ligth, and in fact still is. At least in my opinon, since the lightest comparable stoves would only be around 30 grams lighter. Of course, if I bought a new stove today I would by one of the lightest right now. But I am quite satisfied with this stove and have no plans for radical change. The biggest advantage with the canister stove is convencience. I often cook in my tent, if bugs and rain do not encourage eating out. There it is perfect. The Piezo igniter makes it just dandy to take breaks in the cooking and to reheat your meal of coffee or whatever. 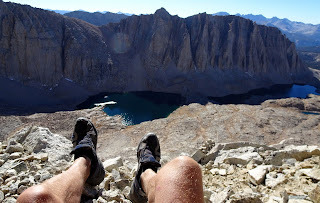 It is also very quick, which really is of no importance when you are hiking solo, but can be an advantage when you are tired and want something hot ASAP. I use 25 grams of gas every day in summer and 75 grams in winter. 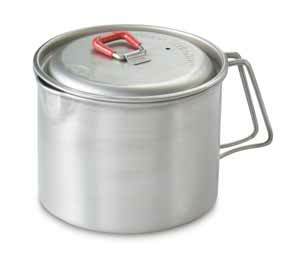 Same stove works down to at least -20 C if you keep the canister in your pocket or in your sleeping bag. On top of the canister there is a Primus windscreen attached. Primus wanted me to give it a try and I will. Unfortunately there was almost no wind while we did our cooking on this trip, so I cannot really say much except that it is twice as heavy as my old falling-to-pieces titanium foil windscreen from BPL. It is also less crackly in the pack and a lot easier to pack, since it fits around the canister if you invert it. The pot was new for the trip, an MSR Titan Tea Kettle 0,85 litres. 92 grams for the pot and 36 grams for the lid made me leave the lid at home. Since the kettle doubles as a cup and I like to have drinks with my meals from a cup instead of straight from the water bottle I brought an extra plate. I usually eat from the pot and drink from a separate cup, but this time I switched it all around. The bowl which, as can be seen on the photo, doubled as pot lid is one of my favourites simply because it is light (17 grams), incredibly sturdy and free. It is bowl from a ready made frozen soup meal. This means it will handle temperatures from -18 C too +100 C. It can be crushed and manhandled in the pack like you would not believe and still do its job. The spoon I used was wooden and I have made it myself, so it will win no prices at any designers convention. Hence no photos. The advantages are that it is environment friendly, very sturdy and also light and cheap. Plastic spoons are fine, but the plastic tends to age and break seemingly without reason after a couple of years. At least I hope they are not made to self destruct. I also have a couple of titanium spoons that do not break but I feel that they are ridiculously expensive and probably leaves a terrible carbon footprint. In deep winter, as I discovered in Sarek a couple of months ago when I could not find my wooden spoon, they are surprisingly cold to the touch and the metal chills your fingers through the gloves even if the other end is shoveling hot food. That was the hardware. The software differs slightly and will no doubt continue to do so as long as I find new and tasty solutions. This is my current winter menu, used in Sarek and also used now in Vålådalen. -Breakfast: 100 grams of müsli with a couple of tbs of dried milk mixed with water. 25 grams of hard cheese rolled up in a soft tortilla. 25 grams of 'beer sausage' rolled up in a soft tortilla. Cup of hot chocolate and a cup of coffe. -Lunch. One bag of Real Turmat freeze dried. In summer only freeze dried every third day. The others are usually powdered potatoes and dried meat or beer sausage. -Three o'clock coffee (it is compulsory for Swedes). 25 grams of hard cheese rolled up in a soft tortilla. 25 grams of 'beer sausage' rolled up in a soft tortilla. 2 Maryland cookies. -Dinner. One bag of Real Turmat. In summer replaced by a package of noodles. Snacks during the day are 100 grams of milk chocolate, 100 grams of hazel nuts and 50 grams of rainsins. I stop every hour for a cup of water and some snacks. In summer I replace the Real Turmat dinner with noodles, which puts me back around 300 kcal. The mashed potatoes and dried meat are about equal to the freeze dried meals. It all adds up to around 3500-4000 kcal per day, which is enough to keep me from either loosing or gaining weight even during hikes of 2-3 weeks and 12 hours of walking. The weight is 800-900 grams. It would not have been enough to keep me fed in my younger days, so food is very much a question of trial and error and constant tweaking. This is just my current menu. It will probably change without warning. did you eat the mini totilla cold or hot? I quess you did not used a oven.. Cold (in winter very cold...). I just roll it around the cheese or sausage. The advantage is that it tastes good (to me)and that bread and the package are very durable/packable. It was interesting on this trip to see everyone's different take on eating during the day. When I'm on my own I tend not to stop for a warm lunch, instead choosing something cold or ready-to-eat like snack bars. When everyone else stopped at middy on this trip I went into 'when in Rome' mode and cooked up some soup. While I always use a canister stove later in the year, when the weather starts getting nasty, it's a huge pleasure to use wood during the 'summer'. Some wood stoves don't weigh any more than the lightest canister stoves and there is ZERO weight on fuel. Sure they take a little longer to boil up some water but they're so much fun! What are the costs of your daily meal, Jörgen? Also, what kind of coffee do you drink when on the trail? Yeah, wood stoves are fun. Once upon a time I used a Sierra stove with a fan. Worked well but was not light at all. There are much better stuff today that use physics instead of fans. I find them execellent for fall trips in the forest, when I am only using a straight tarp. No bug problem and you can cook under a roof if necessary. Also, as you commented, hiking styles differ when it comes to eating habits. Some people only snack during the day, others (me) want to enjoy a hot meal. Travelling in a group you usually have to choose one or the other. Only snacking is better if you want mileage. All a matter of habit and preferences. I do not know the cost, but Real Turmat are expensive. That is why I try to do without freezedried food 2 out of 3 days in summer. Especially on longer hikes. So on a non-freezedried day in summer I eat cheaper than at home. A day in winter with two freezedried courses it is more expensive than at home. Convenience rules, a bit like with the canister stove. I use very ordinary instant coffee, putting the amount I think I will need in a ziploc plastic bag. Some good food ideas there. I must admit to being a tad unimaginative with trail food. I need to get my food a lot more organised and varied I wish Joe would do a how to cook those muffins post or video. Well, I am pretty unimaginative myself, but now and then something new filters through. My personal opinion is that you need to maintain a reasonable balance between input and output while hiking. Loosing weight might be healthy but a hike is probably the wrong place. At least if it means that you spend a lot of your hike with low blood sugar, which is detrimental to decisionmaking and enjoyment. As long as you manage to feed yourself the calories you need on a regular basis and do use mostly dried food there are better areas in which to save weight. 1. A year ago I weight the rubbish I came home with after a week long walk. It was 1kg! This time it was 375g. The main difference was the freeze-dried food container. This time I brought with me Uncle Ben's 5 min rice, sausages and frozen meatballs. The rice I had packed in several zip bags. Next time I will pour the rice in a waterproof bag instead and have a measuring cup with me (a cut down PET bottle?). The blueberry soup I had in ONE ziplock bag with a small measuring spoon. 2. I and my wife meet a man a few days ago on Kungsleden. His plan was to trek the whole path in 8 days. We meet him in the middle. It was his fourth day, so it looked possible. Of course he was an UL addict. His load was 11kg including four days of food. I find it very interesting to see that the reduction in weight changed the walked distance from 15-25km per day to about 50km per day. Not only does it result in longer trekking, but it also result in less food to carry. 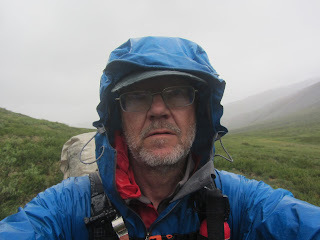 Claes Grundsten has divided Kungsleden into about 28 days in his book. He has dived the path into 5 sections, each between 4 and 8 days. On the longer sections it is possible to buy food during the way, otherwise you have to carry between 4 and 8kg of food. So the people as is able to increase the speed as the weight go down will in return save weight in less weight of food. Yes, you can do very well without using freeze dried food. Lots of home dried stuff can be really nice, inexpensive and fun. Personally I do not feel that you need a special drier for this. Maybe if you plan do make lots. I alway use my ordinary oven at about 50 C (lowest possible) and leaving a crack of about half an inch of the oven door open. Most things dry out well over night. I have mostly dried shreds of meat or minced meat mixed with spices like soya sauce and tomato sauce plus salt and pepper this way. Works like a charm. Leek is easy to dry like this as well, although some vegetables need to be put in boiling water briefly before you dry them. Yes, it would be interesting if others shared their food habits here.